Everyone makes mistakes, but are you making decorating mistakes that can easily be avoided? Keep reading for seven mistakes that homeowners make when decorating their bedroom. 1. Overly-Sized + Underly-Sized Furniture Pieces. The size of your furniture can play a significant role in the room’s overall design. If your furniture is too large, the space will look cramped and unwelcoming. If your furniture is too small, the room will look empty and uninviting. 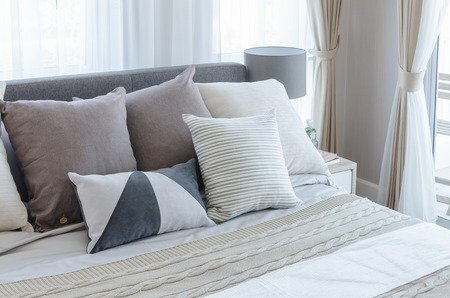 To help make sure that you buy appropriately, you will want to take measurements of your room before you make a purchase. Lay out the room visually on a piece of paper with all of the furniture’s dimensions to help you to see how the furniture will fit inside of the room and guarantee a positive result. 2. Skipping The Ceiling’s Design. Believe it or not, ceilings hold a lot of design potential. Most homeowners will not think twice about their ceilings, but we recommend giving them a second look. When selecting your ceiling’s paint color, you want it to be lighter than your walls and floors. Ideally, the walls should be a medium color, and the floors should be the darkest color. If you follow this rule, you can create a luxurious oasis. Other ways to add detail to your ceiling is through wallpaper, moldings, beams, or stencils. Depending on your room’s architecture, you can create a lot of decorative detail just by looking up at your ceiling. The last thing any homeowner wants is an inadequate amount of storage. To avoid searching for storage, we recommend three things. One, add baskets and bins throughout the room for a decorative yet functional solution to storage. Two, buy furniture with built-in storage like under-the-bed storage compartments. Three, install wall shelving to add storage without taking away from the valuable floor space. These three things could help you clear clutter and storage all of your necessities. At the end of the night, a bedroom is meant for relaxation. If you do not feel comfortable, it does not matter how the room is decorated. Be sure to put your comfort first and search for items that feel soft and cozy to ensure a good night’s rest. If you only have one light in the corner of the room, it is not doing your room’s decor any justice. Be sure to add high-quality lights throughout the space to help open it up during the daytime. 6. Not Capitalizing on Natural Light. If you are blessed with natural light, open the curtains during the daytime to let the light shine inside of your room. This is a free way to make your space feel more open and inviting. While color is not always considered a bad thing, too much color can take away from the serenity of a bedroom. Designers recommend incorporating soft, muted shades to help capture a calm environment. Avoid using harsh colors that demand attention because they can take away your room’s zen and create a colorful mess. We hope you enjoyed this article! Be sure to check out our blog hub at From The Floors Up for more advice and tips.